Pattern Plain, Printed, Embroidered, etc. 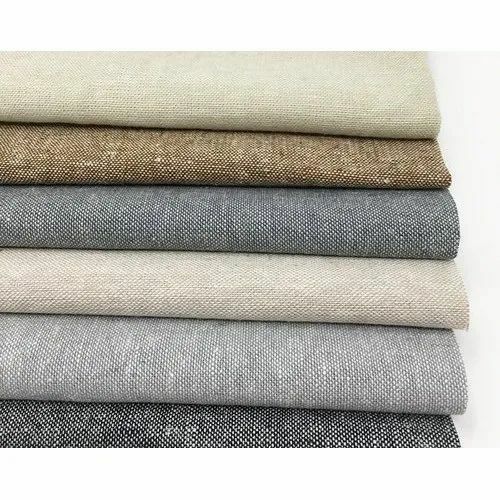 We offer 100% Pure Belgian and French linen fabrics in immaculate quality. Our linen is made from top grade fibers that are carefully selected for quality and strength. The fabric we make is super soft and has an amazing hand feel. We have been supplying linen fabric to many leading brands across the globe for many years. We “Weaves And Hues”, started in the year 2008 as a Sole Proprietorship firm at Jalandhar (Punjab, India), a well-known wholesaler and trader of a reliable range of Stoles, Fabrics, Shawls, and much more. The provided products are widely acknowledged for their appealing look, longevity and seamless finish. Under the guidance of “Tejasvi Minhas" (Proprietor), we have created a strong foothold in this domain. Weaves and Hues is a team made of designers, travelers and star gazers. We view textiles as space where art and science level with each other. We believe that anything that's made should be more than a product. This belief has made us trace the roots and origins of all textiles, adopt age-old traditions and refine them by ever increasing technology. Therefore, we travel across India and beyond to meet with local artisans and experience their craftsmanship first hand, bringing back not only the item but also the story behind it. At Weaves and Hues, we provide aesthetic and cost-efficient solutions to all textile needs. With a transparent value chain, we focus on more than just profits. We strive to make wearable art that's affordable and eliminate the age-old trade-off between quality and price by adopting dynamic industry practices that are ever evolving. At the end of the day, we do not count profits but happy customers.